No matter what business you’re in, online marketing plans are a necessity these days. Realistically speaking, sales pitches no longer work. People want value, and they want it free whenever possible. An effective marketing plan for your business will lead to attract more people and generate more income. This plan can be applied to online businesses as well as traditional offline businesses who wish to promote their business and increase their customer base using the internet. If this is all new to you, do not be overwhelmed. This will help you get familiar with the process so you’ll be able to start thinking how to take a step-by-step approach to create your personalized online marketing plan for your business. You will do this by slowly building an online marketing funnel. Thanks to this funnel, you assist your audience to meet their needs with the most fitting products and services whilst generating income for your business. There is considerable work involved, mostly planning for the time being. Think of your marketing plan as a continuous work in progress. One good thing is the fact that, although you have to consistently work on building and improving your funnel, there are lots of things that you can automate on your website. Once you set them up, you can forget about them. They run automatically. First priority - clearly define your specific topic and your target audience. Who are you going to help? To whom are you going to offer your products? What is my prospects’ biggest problem? What solution am I going to provide to my followers? Where should I go to find my audience? How am I going to attract these targeted people? What am I willing to offer for free? Be prepared to give out a lot of free resources before attempting to sell anything. Keep in mind that people want to be heard and be made to feel important. Show them that you care to listen. Humans crave interaction. Find ways to connect and engage with your followers. What Can You Offer To Establish Rapport? Webinars – Organizing webinars is a great format where you can give the opportunity for participants to ask live questions. Social Media - Facebook posts, Twitter, Pinterest, and other social media outlets are great ways to encourage participation and communication. These are also great ways to continually remind and update your audience about new content posted on your site, product offers, relevant third party content, etc. Blogging - Blog posts help make connections as well as provide a way to encourage audience to ask questions and make comments. Side note – If you are still a beginner and have not yet created a website or a blog with products to offer, do not implement the above for the time being. It is of no use that you attract people to your facebook page posts or to your blog posts when you have not yet structured your marketing. You have nowhere to send them – no lead capture page, no opt-in page, no sales page, no follow up offer. The internet is virtual, so people question whether the person at the other end is real. They want to find an ‘actual’ someone they can resonate with and understand their concerns. People want to feel your voice. Weave your personality, interests, hobbies, and even your struggles in your content, e-mails, videos, about me page, information products etc. Create trust by referring your audience to free useful content that gets them to a result of some sort. Offer solutions, do-able techniques, ideally, stuff they can implement straight away. Leave them better off than before they found your website. This will help initiate and keep an ongoing relationship with your potential customers. One thing to bear in mind is that regardless of how personable you are, accept the fact that people rarely buy something the first time they come across an offer. Be patient, grab their attention, build connections and work to win the trust of your audience first. And remember that whatever it is that you offer - whether it’s free or not, should relate to one another. Do not, for instance, write about coffee and offer vacations for sale. Everything has to go well together. Why Map Out An Online Marketing Plan? The purpose of an online marketing plan is to form a structure - initially to attract a following to your business. As soon as that prospective client clicks on a link that leads to your blog and/or website, they are ushered through this ‘flowing’ pathway – all in a systematic manner – leading them to various stages of the funnel. You will insert a mix of monetization options that you “scatter” throughout your funnel where subscribers will be offered to buy the goods you’re marketing. Designing a ‘map’ for your business will also furnish YOU - the business owner with direction. You’ll always know at what stage you’re at – what tools you need to learn and what to work on next to move forward. The methodology you use to your business’s marketing should reflect you - your character, personality, experience, brand, marketing, business. All these should tie together and make up the basis of your online marketing funnel. There may be an identical business down the road, but its marketing style may be totally different from yours. 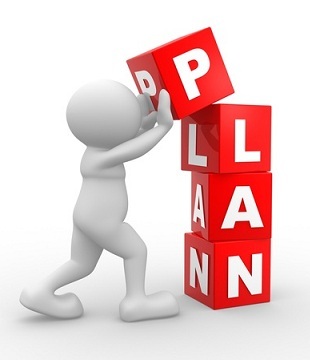 Every individual should customize his/her own plan. Understand the way the funnel takes shape – even if you’re just interested in the very basic to get started. It’s up to you how simple or complex you want to go. Do not limit yourself. Look at all the possibilities, align with your ambitions and go from there. Don’t let anything you don’t know intimidate you. Do what you’re comfortable with, with the knowledge you have. Plan now, execute later, then adjust and refine as necessary. In the next article we’re going to go through each of the four components of an online marketing plan, together with real life examples of various business models. Sidenote - If you want to get a feel of how a Marketing Plan evolves, take a look at this structure, which is specifically aimed for coaches wishing to promote their business online. This will help you brainstorm all your options so as to start sketching out your own marketing funnel. Prepare yourself. Don’t be afraid to learn new things.